Oh, Epsom salt—who knew that such an uninspiring ingredient could inspire such devotion? 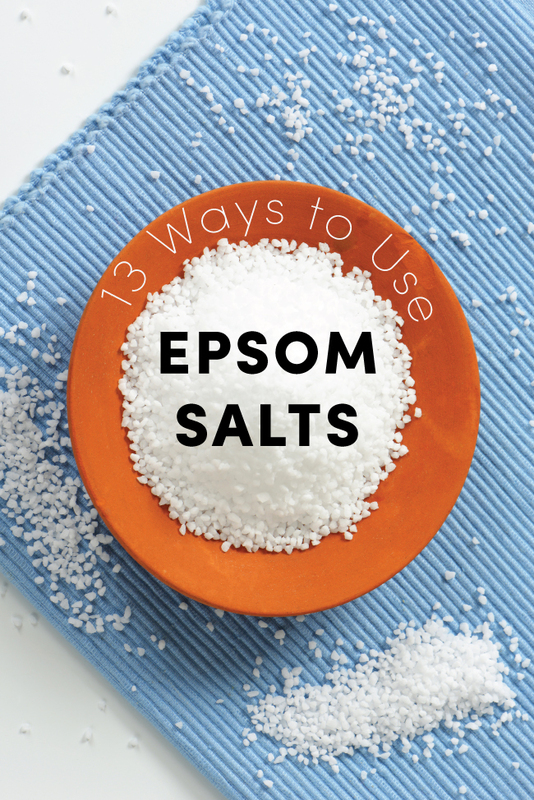 Epsom salts have amazing health benefits–here are 13 ways to use Epsom salts, including a relaxing bath, a face scrub and a hair volumizer. It’s also a miracle cure-all, helping to remove splinters and reduce swelling of sprains and bruises. One ingredient really does fit all! I always knew that soaking in a tub full of hot water with a few cups of Epsom salts was good for relaxing muscles and drawing toxins from the body, but I could never figure out why. And it wasn’t until I spent some time at the Epsom Salt Industry Council web site that I learned that Epsom salts—made of the mineral magnesium sulfate—are also a sedative for the nervous system. 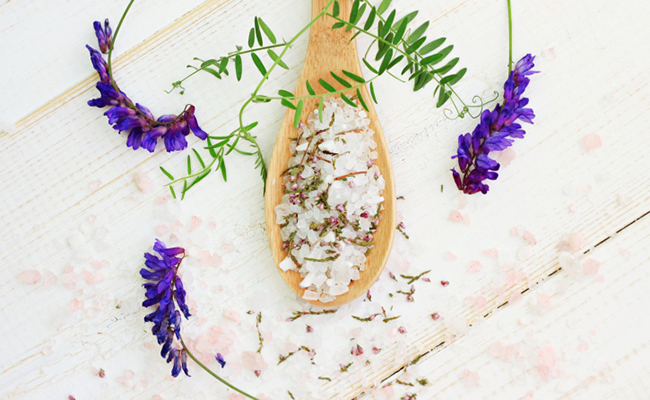 When magnesium sulfate is absorbed through the skin, such as in a bath, it draws toxins from the body, sedates the nervous system, reduces swelling, relaxes muscles, is a natural emollient, exfoliator, and much more. Soothe aches, remove odors and soften rough skin with a foot soak. Add 1/2 cup of Epsom salt to a large pan of warm water. Soak feet for as long as it feels right. Rinse and dry. Or try an Epsom Salt Peppermint Foot Scrub. Soak for sprains and bruises. Epsom salt will reduce the swelling of sprains and bruises. Add 2 cups epsom salt to a warm bath and soak. To tame tendonitis, try these tips. Soak in Epsom salt to draw out the splinter. To clean your face at night, mix a half-teaspoon of epsom salt with your regular cleansing cream. Just massage into skin and rinse with cold water. Apply the mask to damp skin. For normal to oily skin, mix 1 tablespoon of cognac, 1 egg, 1/4 cup of non-fat dry milk, the juice of 1 lemon, and a half-teaspoon of Epsom salt. For normal to dry skin, mix 1/4 cup of grated carrot, 1 1/2 teaspoons of mayonnaise and a half-teaspoon of Epsom salt. This simple honey face mask works wonders as well. Massage handfuls of Epsom salt over your wet skin, starting with your feet and continuing up towards the face. Have a bath to rinse. Epsom salt soaks up excess oil from hair. Add 9 tablespoons of Epsom salt to 1/2 cup of oily hair shampoo. Apply one tablespoon of the liquid to your hair when it is dry; rinse with cold water. Pour lemon juice or organic apple cider vinegar through the hair, leave on for 5-10 minutes, and then rinse. For dryness, here’s how to Repair Your Hair with Olive Oil. Combine 1 gallon of water, 1 cup of lemon juice, and 1 cup epsom salt. Combine, cover and let set for 24 hours. The next day, pour the mixture into your dry hair and let it sit for 20 minutes. Then shampoo as normal. Combine equal parts of deep conditioner and epsom salt. Warm in a pan. Work the warm mixture through your hair and leave on for 20 minutes. Rinse.